Sydney has its opera house, San Francisco its Golden Gate and Durban has its stadium. Gerhard le Roux was lead architect on the iconic project that has transfigured the South African skyline. It’s a role he’s not going to forget. 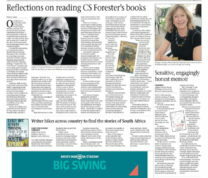 This story was commissioned to be published as a chapter in an eThekwini-sponsored coffee table book on the Moses Mabhida Stadium. 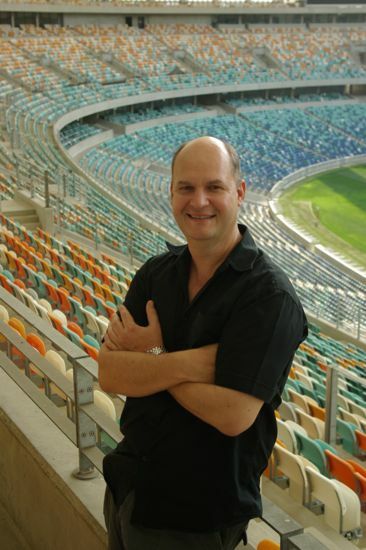 Gerhard le Roux at the iconic Durban stadium. From a distance the monumental Moses Mabhida Stadium with its grand arch imposes its unmistakable silhouette into Durban’s urban skyline. The vision is one of a landmark cultural and architectural icon for the city, KwaZulu-Natal, South Africa and the world. But for the project’s lead architect, Gerhard le Roux, 46, the devil was in the detail. Or rather, the devil might have manifested in the detail had he and his team not paid meticulous attention to an almighty number of facets and features ranging from the immediately visible, such as the colours and durability of the stadium seats, to things you or I most probably would never notice. For example, the angles in the loos and how accessible they would be to the cleaners. One has to pay attention. See: Durban’s Moses Mabhida Stadium: Backgrounder for a perspective from architect Ivor Daniel on the contest and the stadium. The brief from the eThekwini Municipality was to create a world-class, multi-purpose sporting facility and an iconic, innovative and sustainable landmark for Durban. The stadium would be the jewel in the Kings Park Sporting precinct. The entire area would feature additional sporting arenas and facilities as well as restaurants, shops, children’s play areas and a pedestrian walkway linking the stadium complex to the beach. 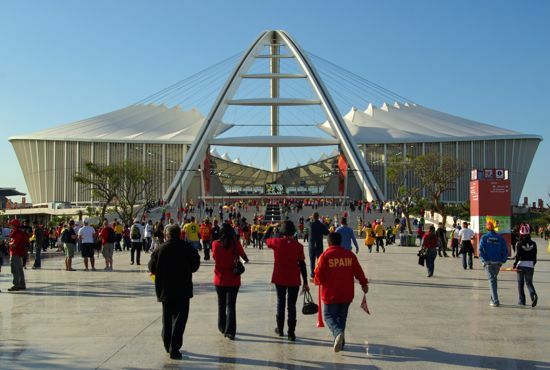 Moses Mabhida Stadium before the Spain vs Switzerland game in 2010. “Because of the project’s impact on the city, the architects and urban designers had a responsibility to consider the design right from the harbor through to the Umgeni River, including roads and open spaces,” says le Roux. and to manage the architects in the Ibhola Lethu Consortium — the collaboration formed to pitch for the contract, that won the contract, and that realized the vision which, among many other things, has given Durban a winning venue for any future Olympics bid. Le Roux is quick to point out that while his involvement began with the concept design, included design development, and incorporated final decisions on all aspects of the building, from start to finish the Moses Mabhida Stadium was a team effort and an architectural joint venture. 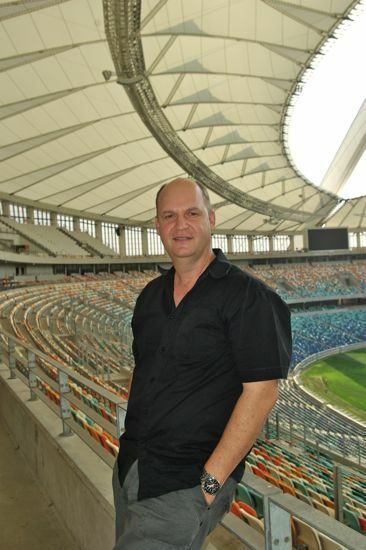 Moses Mabhida Stadium lead architect Gerhard le Roux inside the stadium. The inclusion of the Germans was a wise strategic alliance. “We identified them as good partners and invited them to be part of our consortium because of their very specific skills and experience building three stadiums, with FIFA, for the 2006 World Cup,” says le Roux. Still, it was a major process having so many people involved. At peak, there was a stadium workforce of more than 2,800 people on site. There were the ‘green’ details. 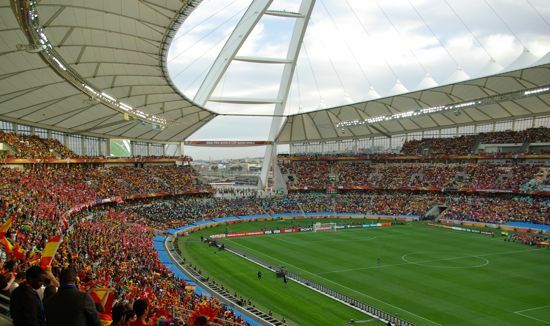 The Durban stadium has won acclaim as the greenest stadium built for the 2010 World Cup. Initiatives included the incorporation of a harvest tank, which collects rainwater from the roof to irrigate landscaping; energy-saving light fittings and regulated water flow devices; double-glazing and sun-control features on all windows. 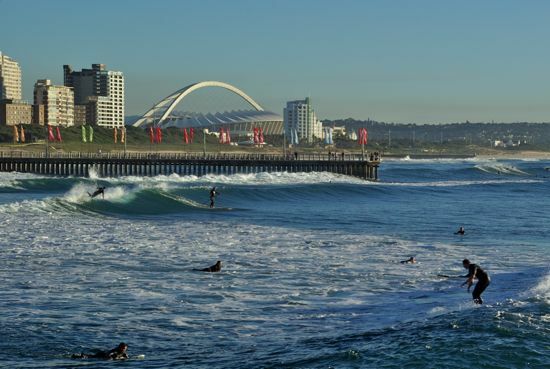 Durban surfers and a view of the iconic Moses Mabhida Stadium. Then there were the wind details. “The biggest factor we had to consider was wind loads on the building given that the stadium would be situated in a flat coastal belt. Wind tests were done. These indicated the degree of perforation required on the outer facade. This became integral to the design concept. There were a myriad security details plus design details that took into account options and potential use. “We designed the retail area to operate outside the secure zones so stadium security would not be compromised. In addition, we put convenient, visible parking close to the retail area plus additional safe undercover parking. The cable car is an obvious attraction and the retail area was designed to optimize visitor potential,” he says. Inside the stadium during the Spain vs Switzerland game in 2010. And there were the aesthetic details grounded in practicalities. The seat colors, for example. The stadium needed 54,000 permanent seats and the ability to increase to 85,000. “It was vital to be able to increase the seating without taking away the architectural beauty; the aesthetics; the escape routes; the sizing,” says le Roux. “Detail design is important in any quality architectural building. It is not always in the visible aspects but the combination of all the detailing at the end provide the final result. With the seats, for instance, we had about 30 options installed on a temporary stand and we jumped on them and did things that could pop rivets to see how they withstood wear and tear. We didn’t want something that could cut someone’s hand, for example. 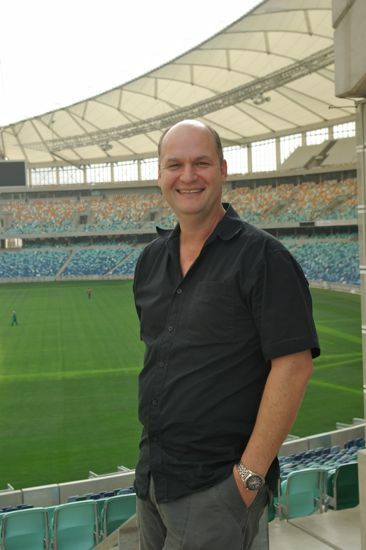 Gerhard le Roux, lead architect on the Moses Mabhida Stadium project. There are 11 seat colours in the stadium. “From a management point of view, this was a nightmare,” says le Roux. “It meant they would need to stock 11 replacement colors for if a seat gets broken, and they do. Things happen. It’s a marriage of quality and practicality. It was a wow moment. Since that first intimate ‘wow’ moment, there have been so many more. “The first game, for instance,” he says. “And so many comments. One of the nicest thing now, says le Roux, is to walk into the stadium “and remember how much you discussed the details.” And within this context, to see how much the end product looks like the initial idea. Tranformed the face of Durban, that did. What are they going to turn it into a rugby stadium? Wouldn’t it be good to go there rather than that tired old concrete stadium next door? Great stadium Craig so it must hurt that municipality not maintaining it properly as I read recently. And despite its architectural delights not designed as soccer or rugby stadium but athletics. But how come no trwck seven years on. Fans too far from action which takes away intimacy and buzz. Sorry. Great design and impressive but does not work when watching a match.